When I realised I’d need a hammer to make the Hummingbird Coconut Meringue Cake, I instinctively developed reservations about it. ‘Fresh coconut tastes better’, declared the author. I’m sure it does, in much the same way that basking under the sun on a private beach on Necker warms your bones more gratifyingly than a sunbed in the local tanning salon. Note to self: sometimes you can ignore the author. Note 2 to self: no, no you can’t. Other people can. Get the hammer. Welcome to a cake tragedy. It started poorly – when you can’t get butter and sugar to cream, it doesn’t bode well for a light fluffy cake. I wondered if the butter had been too cold, so I consulted the cakey gurus. Yup, I phoned my mother and father. Baker of birthday cakes for many years, and former commercial bakery owner/manager respectively. Maybe it could have been softer was the consensus, but sure keep beating it and see what happens. You can’t make it any worse. No better either, it seems. The ratio of sugar:butter at 370g:70g just didn’t seem right to me. It had the consistency of grainy melted marzipan. I chucked it and started over. It didn’t improve much. I persevered. Someone wrote, tested, proofread this book, right? It must be correct. Note 3 to self – errata do occur. I looked up the errata. They were no help, but you now have the Brooklyn Blackout Cake recipe should you be brave enough to try it. I baulked slightly at the seven eggs required for the meringue frosting but started separating. You know the sage advice about separating the eggs into a cup and then putting the whites in a bowl? Of course I wasn’t doing that. On the seventh egg I sliced neatly through the yolk and the yellow plummeted into the Sea of Albumen. I know I should have chucked it all out but I removed as much as I could instead and made up the meringue frosting. With a lot of extra sugar. It was still runny as all hell, so I mixed in some of grated coconut for texture and to bind it. A bit like mixing mud and straw as building materials. Just really sweet mud. On the plus side, if I ever want to recreate Tunnocks Snowballs at home, I’ve got the filling cracked. Oh, why did I need the hammer? To pierce the eyes of the coconut and drain the milk, then to smash open the shell later. My neighbours looove me now. It was better the next day. It could really do with being two tiers rather than three, it’s simply too much cake and the sugar rush from the amount of frosting required to cement it together could put you into a coma. The texture was so dense it reminded me of breeze blocks. I’m a fan of the book but won’t be making this again. I don’t know how I feel about the above comments.Satisfaction that I’m not the only one to have all the problems with the actual baking,or panic because it’s my little grandson’s birthday cake,and the guests will need their teeth for several years to come.It’s too late to run to the supermarket as I live in the country and it’s too far away.What to do now???? ?Make the best of a bad job,I suppose,soak it with the syrup,decorate and hope for the best.But that’s my reputation as the family birthday cake maker right down the drain.Let’s hope the cake doesn’t go the same way!!!!!!! I was thinking of making this for my friend’s birthday… you have convinced me otherwise! Thank you! I’m sure others will have more success but I just made such an utter hash of it! 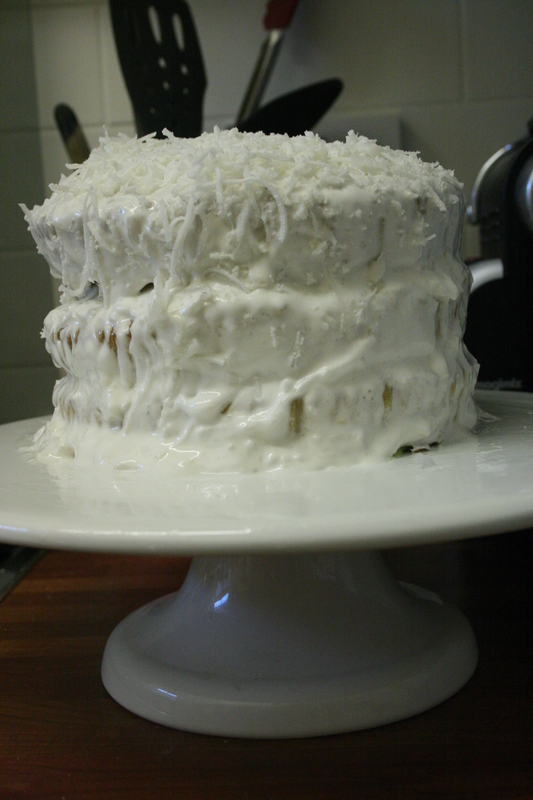 I believe that Edd Kimber’s book, The Boy Who Bakes, has a coconut cake recipe in it… much safer I’d say! After making several cakes from the Hummingbird book I thought I’d try the coconut meringue cake. My an experienced cook and knew that instinctively that the ingredient amounts seemed odd, but I persevered hoping that my past experience with the other cakes made would prove me wrong. The cake, three tiers, was enormous. The meringue was lovely admittedly. The coconut a nightmare to access. Cooking utensils shouldn’t have to include a hammer!!! Once assembled I gathered my husband and kids into the kitchen for the taste test. The cake was a monster and not very appealing. The taste was, to put it mildly, was disgusting. I followed the recipe to the book, and can hand on heart say this was a total waste of time, money and effort. I tried to convince myself that it tasted OK and felt relieved to bin the monster and remove all traces of it from my kitchen. I suggest if you want to make a coconut meringue cake. Just make one of your tried and tested victoria sponges. Ice it with the meringue and coat in dissicated coconut. Not a hammer in sight. I do wonder if Hummingbird bakery actually try and test their recipes. Whoever created this monstrosity should be shot for wasting our time and money. The carrot cake on the other hand is devine.